The most serious sudoku puzzlers now have their own book dedicated to the conventional 9x9 grids. For the true sudoku devotee there can be no other magazine. Sudoku Grand Masters is designed for the real expert and each issue starts at the intermediate level progressing to the devilishly difficult Expert Level 2. 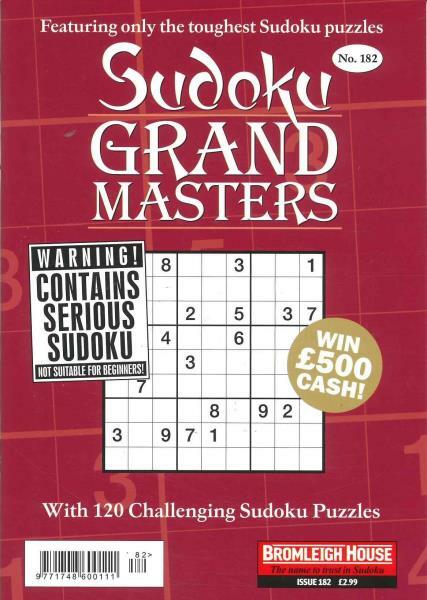 Grand Masters is sudoku in its purest form and features only 9x9 grids. It's more challenging than most others on the market. Best Sudoku magazine as at has the right level of challenge for me- although Killer Sudoku get the better of me and I would prefer less of these and more of the regular Sudoku. I love this magazine, it just hits the spot between being too easy or too difficult, but would like more in the Grand Master 2 section. I really enjoy receiving my sudoko puzzle book and find it is a constant companion. Brilliant magazine. Keeps the brain turning over !!! Excellent for my purpose of keeping the brain active. Absolutely excellent mag. Not THE most difficult puzzles but pretty hard usually. Splendid puzzles, just the job! I could no longer find this in the shops. It is the best Sudoku magazine on the market. I love this mag as it only has difficult puzzles in and I find most Sudoku mags just too easy. Had been buying this ad hoc anyway so a subscription made sense. Challenging and enjoyable as always. Excellent and at the correct level. The puzzles are excellent and I've been doing them for years especially the difficult ones. Had difficulty getting my subscription in the past but appreciate the 'heads up it's coming' email and have had no problem getting them since you've been doing it! Thankyou! My husband is addicted to this magazine not a day goes by without him puzzling away! Grand Masters 2 is fantastic - they use so many different algorithms in the puzzles that there is no way to 'anticipate' answers. I love cutting out pages to give to sophisticated 'experts' and watch them be delightfully challenged. Absolutely the best sudoku! Brilliant Sudoku - really difficult but do-able! Thank you.